We received 2 huge bunches of spinach this week, so I was anxious to start cooking. I have never liked spinach, but my taste buds have changed so much over the past 12 months, I am loving the taste of this iron packed vegetable. In a medium saute pan, heat up 1 Tbs water on medium heat. Add the onion, garlic and basil and saute until softened and fragrant, about 3-5 minutes. Add the tomatoes and stir until well combined, 1-2 minutes. Add the mushrooms, season with salt and pepper and cook until softened, 5-10 minutes. If the vegetables start to stick to the pan, add a couple tablespoons of water and scrape the bottom of the pan. Once the mushrooms are softened, add the spiralised celeriac and carrot, chopped spinach and ½ cup vegetable broth. Toss to combine. Lower the heat to low, cover and cook for about 5 minutes or until the celeriac is al dente in texture. Season with black pepper and a sprinkle of yeast flakes. Summer and Autumn Salads have pretty much disappeared from the Farmers Market, and winter is here with cold days that really call for something warm for lunch. This salad was warm, filling and nutrious. Red Quinoa, Purple and Green Kale, Red Onion, Mudrooms, Apple with toasted pumpkin and sunflower seeds. Dressing was tahini, lemon juice, balsamic vinegar and a dash of maple syrup. Red Quinoa - is an ancient grain that is one food that fit people love due to its unique nutritional profile, as it contains a significant amount of protein, antioxidants, vitamins, and minerals when compared to other grains. Quinoa is one of the few grains contains all nine of the essential amino acids. Most grains are low in lysine, therefore they are considered incomplete proteins. But, quinoa actually contains lysine, as well as all eight of the other amino acids, making it a complete protein, similar to animal proteins. Quinoa is considered one of the super foods! It is a tremendous source of vitamins and minerals such as riboflavin, magnesium, and iron. Quinoa nutrition is high in many nutrients lacking in our modern diet due to the overconsumption of highly processed foods. It is high in B-vitamins such as riboflavin and folate, which are low in many modern diets as these nutrients tend to be lost during food processing. Since quinoa is a whole grain, it is not refined or processed, therefore all of the important vitamins remain intact. Winter is here and there is a huge range of different fresh produce at the market. 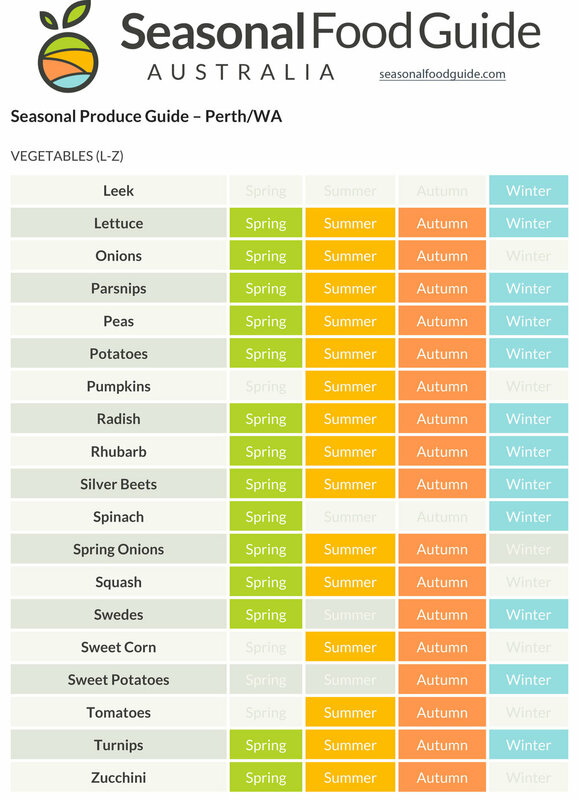 We love to eat in season as the produce is fresher and generally cheaper. This was our lunch today. We still like to eat a RAW dish everyday. Dress the shredded vegetables and hemp seeds with dressing; you can use as much as you like, but make sure you coat everything well! Serve. Leftovers can be kept in the fridge for the next. No leftovers for us. I first saw this dish on a Facebook page 'Food that No One Died For' Just love the idea behind this site and it is full of yummy recipes. Based on a recipe from the book "Feel Good Food" by Tony Chiodo. As always I like to put my own twist on recipes so they are less refined and more rustic. I used all fresh ingredients for our local Farmers Markets. 500 g butternut pumpkin, cut into large chunks, leave on the skin and leave in the seeds. Bring 3 cups water to the boil in a saucepan over high heat and add the corn kernels, onion and a teaspoon of sea salt. Stir in the polenta, reduce the heat to low, cover with a lid and simmer for 30-40 minutes, (or according to directions on packet. I used a fast cooking polenta and it was ready in 5 mins) stirring occasionally, or until the polenta comes off the sides easily. If the polenta thickens early, stir in some more water. Stir in the basil and pour the mixture into a lightly oiled 16 x 21 cm baking dish. Arrange the broccoli florets over the top of the polenta. For the topping, roast the pumpkin and onion with a pinch of sea salt until soft. Pour the mixture over the broccoli and polenta and allow it to set in the refrigerator for about 30 minutes. Top with some toasted pumpkin seeds and serve on spinach leaves with a drizzle of balsamic glaze. You can serve this dish at room temperature as a slice, or bake it at 170°C for 15-20 minutes, or until lightly browned, for a more wintry meal. WFPB/Vegan - What do we eat? Some people think we live on lettuce leaves and kale. This is really what we eat. Whole grains: millet, quinoa, barley, rice, whole wheat, oats, freekah etc. We eat Pizza, Burgers, Lasagna, Curries, Creamy Soups, Quesadillas, Nachos and lots of salads, char-grilled vegies, stir fries. There is so much variety in our day to day meals and the internet is a wealth of information and recipes. We go to the Farmers Market every Saturday morning and source fruit and vegetables. We are trying food we have never tried before and are loving the variety and colours on our plate. Every week we try a new food that is in season because that is when you get the most flavor and nutritional value and when it is the most affordable. We buy locally, getting our fresh foods that are seasonal, fresh, and we support local farmers our community. We may wind up spending more to put our money where our taste buds (or personal ethics) are, but it is a trade-off that's worthwhile in the long run. 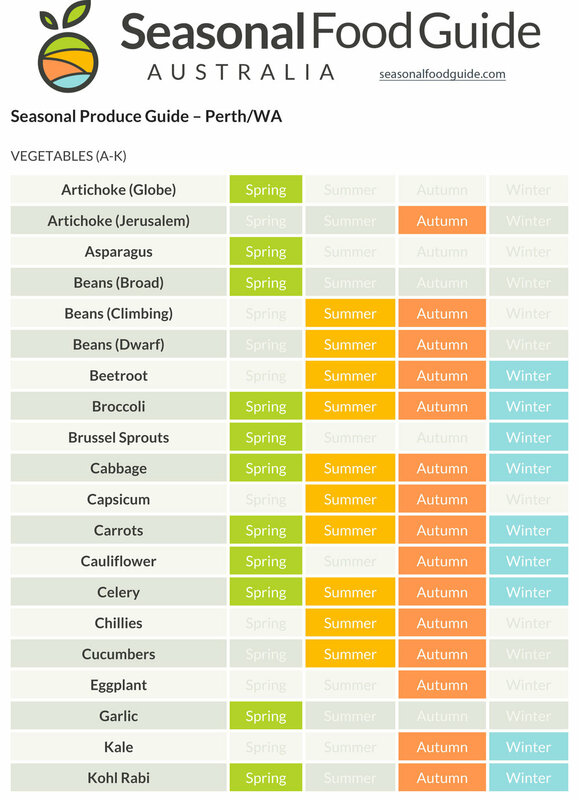 eating what's in season is that you get a broader variety of foods in our diet. Those foods expose us to dishes and ingredients we may not have otherwise explored, and it also helps us eat a more well-rounded and balanced diet as well. People who practise a vegan lifestyle do not eat animal-based products, including meat, dairy, eggs, or animal-derived ingredients, like honey. This lifestyle extends beyond excluding food and ingredients made from animal products and is carried over to everyday life items, such as shoes, clothes, accessories, makeup, shampoo—anything made with materials that come from or are tested on animals, like leather, silk, wool, gelatin, beeswax, personal products such as makeup and lanolin. Preventing the exploitation of animals, having true compassion for their treatment and having an emotional attachment to them is a key reason that most vegans adopt a veganism lifestyle. Going Vegan does not automatically make you healthy but will make you healthier than you are now. Becoming vegan is based on ethical choices not necessarily healthy ones. It’s easy to be unhealthy on a vegan diet. Sodas, chips, Oreos, added sugar, refined grains and oils are all unhealthy vegan foods. Being vegan doesn’t mean caring about health. Being vegan means caring about morals, ethics and compassion. Just like the vegan diet, people who eat a whole food plant-based diet avoid animal-based products, including meat, dairy, and eggs, but also avoid processed foods, including oil, white flour, and refined sugar. This way of eating is based around unprocessed or minimally processed veggies, fruit, whole grains, beans, legumes, nuts, and seeds. WFPB is also a lifestyle choice but is not based on animal ethics or emotional attachments to animals, rather it is based on a healthier lifestyle. We do not focus on portion control but on calorie density instead. “Whole foods” are foods made with whole plants—plants as they look when they are harvested: the whole apple, squash, bean, or grain, relatively unprocessed and unrefined. Whole foods contain all of the natural nutrients of plants. “Plant-based” means foods that come from plants, rather than animals. A plant-based lifestyle relies exclusively, on whole plant foods. We are not keen on labels but your HideAway Haven hostesses are vegan for ethical reasons and WFPB for health reasons. There are literally thousands of low-fat WFPB recipes online. You only need a half dozen to a dozen that you really like. Don’t get overwhelmed. Try a few here and there until you discover what you like! Fat-Free Vegan Kitchen. Hundreds of well-organised recipes. Forks Over Knives Recipes. Great recipes. Be sure to also sign up for the newsletter to get new recipes delivered via email. Engine 2 Diet Recipes. Find more great recipes in Rip Esselstyn’s books. Straight Up Food. Cathy is a great chef and a culinary instructor. McDougall Newsletter Recipes. This is a massive database of recipes, look for this link, along with other useful recipe collections. The Cancer Project Recipe Index. Plenty of gems. Naked Food Magazine. This is a new WFPB magazine. Protective Diet. Oil, Sugar, and Nut Free Recipes (requires free registration). See this list of 19 Healthy Vegan Cookbooks You Won’t Want to Go Without. Mary’s Mini (This is a short-term whole food, plant-based diet plan if you really want to drop the weight quickly.) See also this Mary’s Mini Facebook support group. Word of Wisdom Health Challenge. This is a do-it-yourself program that I sponsor. You can join the Facebook groups where we help support each other. The Protective Diet (free registration for many recipes but if you pay for the program you get many more recipes and great support; it costs $100 to sign-up plus $29.97 monthly membership fee for unlimited access, you can cancel at anytime). People I know love this program. Bright Line Eating. This is a very strict (and expensive) support group program geared to helping people with serious food addiction to break free. It is not strictly WFPB, but you can easily combine this program with the WFPB Guidelines (there is a version of Bright Line Eating that supports this). The four basic Bright Line rules are (1) no sugar; (2) no flour; (3) eat during meals and not in-between; and (4) measure and weigh all food. Since our journey we have had friends and family ask how do we make the change? where do we start? how did you do it? Don't make it complicated. Just begin. Don't over complicate the process of change. Don't wait for a great moment, turning point, an inspiration. Forget it. Just begin. Don’t wait for the golden moment. The turning point. The magic key. There isn’t one. If you want to change something in your life, don’t plan to change the whole thing at once and “really get into this.” Forget it. Just begin. First - why you want to do this.? To loose weight? To get healthy? To save the animals? to save the planet? To us this is not a diet to lose weight, but a complete lifestyle change. Yes you can lose weight, anywhere from a little if you only need to lose a little to a whole lot if you need to but to us it was really more about our health, the animals and our planet. Just begin - focus on the big picture and if you need to loose weight you will. Second - do it as a family. Even if your partner doesn't need to loose weight everyone will benefit from eating healthier including the animals and planet earth. This is a get healthy, stay healthy lifestyle - not a diet. A Whole Foods Plant-Based lifestyle should not cost you anything. You're buying food now, so it's just replace one group of foods with another. This is a Whole Food - Plant Based Lifestyle not a vegan lifestyle. (though we are both). Eliminate heavily processed food (if you cannot pronounce the ingredients on the packet, leave it on the shelf), cut out refined sugar and oil. Ensure the majority of your calories and nutrients come from fresh and whole food. Are you ready to just begin? Veganism might seem like just the latest dieting trend, but the truth is that there are purer reasons behind going vegan than just doing it to lose weight. Many people become vegan for the health benefits, since eating whole foods as often as possible is great for your body (and soul), but even more people choose veganism as a refusal to be a part of the animal cruelty that goes into all aspects animal-based foods. Though choosing to go vegan might seem easy, there is a lot of work that goes into it, and preparing to eliminate meat and dairy from your diet is harder than anything. That’s why this list provides many options to choose from, in case you’re less into tofu and more into beans, for example. Of course, these options work for vegetarians as well, but the focus is on people living a vegan lifestyle. Take a look below, especially if you’re looking to become vegan or wondering what to cook on Meatless Mondays. Mushrooms have gained popularity as a substitute in burgers recently, even amongst people that aren’t vegetarian or vegan. They offer a meaty taste but are much healthier, and the most popular ones are cremini and Portobello. Popular ways to cook mushrooms are to saute them in (vegan) butter and add thyme, black pepper, and balsamic vinegar. Put them over polenta or put them in a roll for a French dip sandwich. You can also use them for recipes like “beef” stroganoff or burgers. This is a fruit which isn’t that common in the U.S. simply because it’s not well-known, but for those that know it they can attest to its flavor being odd because it’s a fruit. It’s actually perfect for substituting meat because it’s savory and can be used in dishes such as barbecue sandwiches, stir-fries, or any dish that uses beef, pork, or chicken. Eggplant is touted as an option for meatless people, but most people can’t think of anything other than parmigiana to use eggplant for. It has a rich, meaty taste and is very versatile. Try eggplant burgers if you think you’re not a fan of eggplant, and then once you realize you love it (we know you will), go ahead and try things like vegan mozzarella-stuffed eggplant meatballs or crispy eggplant fries with marinara dipping sauce. Lentils also have a reputation as being a good source for vegetarian people, since it provides some of the protein and vitamins that people lose when they suddenly stop eating meat. They are hardy, can replace ground beef easily, and are often made it into burger patties. They come in a variety of colors, but you can use any color to make your dish meatless. Try red lentil burgers with kale pesto or lentil tacos. These are not only delicious, but they’re also inexpensive and healthy for you in comparison to red meat. You can choose from black beans, kidney beans, pinto beans, aduki beans, chickpeas and black-eyed peas, to name just a few. Beans make for hearty soups, stews, and chilis. Try white bean and kale soup, black bean burgers, or black-eyed pea Italian sausages. This vegetable has been long overlooked as a substitute but it’s slowly coming to the light as a good substitute for meat, bread, and cheese. When you season and cook it right, cauliflower can become the star in a dish like Cauliflower Manchurian or Piccata. Look up a recipe for cauliflower pizza crust if you’re interested in what else the vegetable can do. Potatoes are usually treated as a side piece but can actually shine as the main squeeze in a variety of dishes. You can roast, boil, bake, mash, or fry them and easily make creamy potato and cauliflower soup, potato samosas, or a Moussaka burger with cheese sauce. Most people don’t know what to do with beets and don’t make the effort because of the signature red hands you end up with. However, beets are like nature’s candy and are perfectly sweet for salads but deliciously savory as a meat substitute. You can appreciate them in roasted beet burgers or beet carpaccio, and even make a dessert like beetroot chocolate cupcakes to wow your guests. Nuts are like a vegan’s savior because they can be used to make important dairy alternatives like vegan cheese and milk. Nuts are actually surprisingly “meaty” and can easily make a rich “meat”loaf or kidney bean/walnut burgers. Are you ready to try any of these alternatives? Did you see any options that you didn’t know about before? Let us know in the comments! Maggie has had asthma and allergies most of her life. Since switching to a WFPB (Whole Food-Plant Based) lifestyle the asthma attacks have significantly reduced from 2-3 per day to 2-3 per year and there are no signs of any other allergic reactions such as hives and sinus infections. Alternative health practitioners are agreeing that nature’s top edible antihistamines are found in foods containing Vitamin C, and Quercetin (a powerful flavonoid, sometimes called bioflavonoid). Additionally, there is much evidence that eating foods rich in Omega-3 Fatty Acids reduces allergic symptoms. We eat a variety of plant based food that contain natural allergens. In a one-year study, significant improvement was found in lung function tests and a major reduction in medication use when patients switched to a vegan diet. Why do vegetarian and vegan diets help? Researchers first attributed these benefits to the absence of common food triggers, such as meat, dairy and eggs. After all, if you’re not eating troublesome foods, you can’t have an allergic reaction to them. But there’s probably more to it. Repeated studies have shown that people who eat more fruits and vegetables have reduced risk of asthma, presumably because these foods improve immune system functions. Vitamin C - Allergy relief is among the many miraculous uses of vitamin C. Vitamin C is an antioxidant that stops histamine from forming. It also helps balance the immune system by functioning as an anti-inflammatory. Good food sources of Vitamin C are guavas, blackcurrants, red bell peppers, kale, parsley, green sweet peppers, broccoli, brussel sprouts, mustard greens, mango, watercress, cauliflower, red cabbage, strawberries, papayas, green and white cabbage, spinach, citrus fruits, elderberries, calf liver, turnips, peaches, asparagus, cantaloupe, cayenne pepper, green onions, new lima beans, black-eyed peas, green peas, radishes, raspberries, yellow summer squash, sweet potatoes, loganberries, tomatoes, new potatoes, lettuce, bananas, kiwi, honeydew, pineapple, cranberry juice, vegetable juice, tomato juice, rutabaga, and kohlrabi. Quercetin - is a type of flavonoid antioxidant that’s found in plant foods, including leafy greens, tomatoes, berries and broccoli. It’s technically considered a “plant pigment,” which is exactly why it’s found in deeply colored, nutrient-packed fruits and veggies. Did you know quinoa is not actually a grain, but a seed that's closely related to the beet family? Of course, in cooking it's used as a grain because its nutritional and culinary properties more closely resemble true grains like millet, brown rice, and oats. Quinoa has been cultivated for over 3,000 years in the Peruvian Andes, where they call it the mother of all grains, and there are over 120 varieties! Quinoa can grow in diverse climates and terrains, including areas with minimal irrigation and fertilisation, or as little as three to four inches of annual rainfall. The quinoa crop protects itself from predators with a waxy, bitter-tasting coat of saponins, an organic chemical compound that gets rinsed away during cultivation. Resourceful Andean families would traditionally save this saponin-heavy wash water to use as shampoo. Waste not want not. We love our quinoa dishes. Red is our favourite, but mixing the white, red and black gives lots of different textures. This week we had a special vegan guest and it was our turn to shine making a special breakfast for her every morning. We made a Farmers Market Breakfast Bowl and added tofu scramble. As a spin off on this dish we enjoyed a Farmers Markets Dinner Bowl and added some char-grilled baby eggplant and zucchini. This was a bowl full of goodness. Heat oil (or if you prefer to cook with out oil, add a little stock) to fry-pan. Add spices, onion, red pepper and saute a few minutes. Add the kale or spinach and heat until just wilted. Add the cooked quinoa and stir through gently. Place on plate and add the char-grilled vegetables. Buckwheat – a nutrient-packed, gluten-free seed abundantly consumed in Asian countries for centuries – is now becoming increasingly popular in the U.S., Canada and Europe due to its many health benefits. Despite its recent rise to nutrition fame, buckwheat is actually an ancient grain with a long history. Today, buckwheat is a favorite amongst plant-based and gluten-free eaters alike since it provides a high source of amino acids, vitamins, minerals and antioxidants – all with relatively few calories and practically no fat. Despite its name, buckwheat actually doesn’t contain any wheat or the protein gluten..
As a vegn, buckwheat is a great food to regularly include in our diet because it provides two types of essential amino acids — types we cannot make on our own and must get from the foods we eat. Buckwheat nutrition contains essential amino acids called lysine and arginine. What’s important about this? These specific amino acids aren’t found in many other common cereal or whole grains, so getting them from buckwheat ensures you cover the full range of essential proteins your body needs. 1. Place the buckwheat and 1¾ cups hot water in a medium saucepan and bring to a boil over high heat. Remove from the heat, cover, and let stand for 10 minutes, until the water is absorbed and the grains are soft but chewy. Drain any excess water. Fluff the grains with a fork and set aside to cool. 2. To make the dressing, combine the lemon juice, vinegar, and garlic in a small bowl. Add salt and pepper to taste. 3.. In a large mixing bowl, combine the zucchini, buckwheat, onions, tomatoes, and coriander . Add the dressing and mix well. 4.. In another bowl, toss the rocket and baby spinach in the orange juice. Place the greens on individual salad bowls, and top with the grain mixture. Serve garnished with roasted pumpkin seeds. 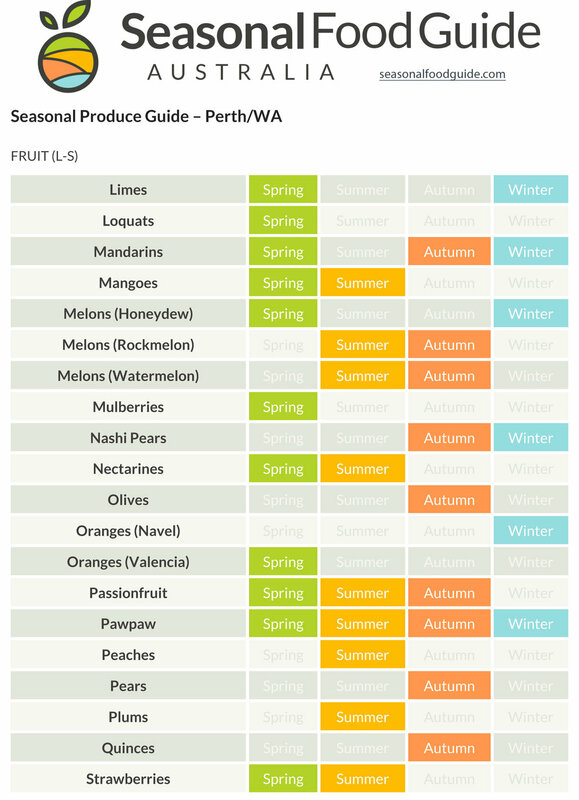 Eating seasonally makes eating interesting and fresh. The ideal autumn diet helps transition our bodies from summer's lighter intake to heartier winter fare. Seasonally fresh produce is picked when they’re ripe and fully developed. The plant has had more sun exposure, which means it will have higher levels of antioxidants When there’s abundance of a product, the prices go down. Seasonal produce can grow without too much added human assistance i.e. pesticides and genetically modification. We know how these toxic compounds can contaminate the water and soil and also our health. 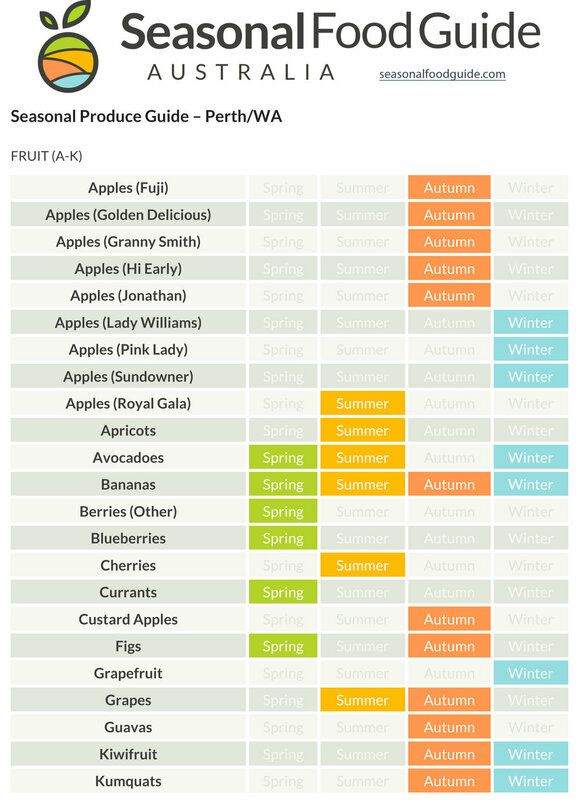 Seasonal food that is locally produced, reduces the load on our environment due to transport, or “food mileage”. We love getting to know where our food is coming from, who is growing it and how makes us feel more connected to that whole process. Our local Albany Farmers Markets creates a community around food that encourage us to share our knowledge, ask questions and engage in our own local environment. Here is the recipe for the dinner I made last night. Preheat the oven to 200 degrees. Chop the cauliflower into small florets. Peel and chop the sweet potatoes, chop the squash and capsicum. Place on a baking sheet and drizzle with oil. Sprinkle with smokey paprika, salt and pepper. Roast for 20 minutes, stir, and roast for another 10-15 minutes. When they are golden brown and soft, remove from oven and set aside. In a frypan add chopped kale and wilt in a frypan with a little oil or broth (I added garlic, chillies and basil) until bright green. Add to the roasted vegies. Put pecans into a dry frypan, add maple syrup and salt and cook until crunchy. (be careful not to burn, due to high sugar content of maple syrup) Stir constantly, about 3 - 4 minutes. We are really feeling the cold. It hasn't been a super hot summer anyway, but what used to feel warm, feels cold now. The last of the fresh Asparagus was at the markets today, so we decided a soup lunch to warm us up. Cut asparagus into ½-inch pieces. In a large pot, heat margarine over medium-low heat, and cook the onion and garlic for a few minutes, until softened. Add asparagus pieces and salt and pepper to taste, then cook, stirring, 5 minutes. Add broth and simmer, covered, until asparagus is very tender, 15 to 20 minutes. Add cashews and purée soup using an immersion blender (or in batches in a blender) until smooth. Season with lemon juice, and salt and pepper. HINT: We always have a supply of soaked cashews in the freezer. Asparagus is a nutrient-packed source of vitamins, minerals and essential proteins. Asparagus is rich in vitamin A, vitamin B1 (thiamine), vitamin B2 (riboflavin), vitamin B3 (niacin), vitamin B5 (pantothenic acid), vitamin B6, folate, vitamin C, vitamin E (alpha-tocopherol), and vitamin K (phylloquinone). The mineral treasures that are stored in asparagus include iron, calcium, phosphorous, magnesium, manganese, zinc, selenium, and potassium. Nothing tastes as good as health feels! No make of ice cream. And certainly no greasy fast food meal or takeaway pizza. As a life-long foodie, sugar addict, meat eater and all-round glutton it took me a lonnnng time to learn the above. This goes far beyond discovering that, for the first time in years, we actually have the energy to effortlessly do everything we need to do and more. We have banished all processed junk, synthetic substances that masquerade as “food”, from our diets and lives, and have come to realise that fantastic though the physical rewards are, they pale in comparison to the mental and emotional ones. Sadly, most people don’t understand that because nothing tastes as good as health feels this is not about self-denial but about self-fulfilment, it is not about just another fad diet but a complete lifestyle change. Every one of us in western society was raised on either small, medium or super-sized amounts of drug-like foods so we all have to go through a period of mind-body adjustment before we discover how good true health actually feels, but the good news is that if you stick with it and deal with whatever comes up you reach a point where you no longer need stimulants to pick you up nor depressants to numb you out. How could anything that merely excites your taste buds before temporarily scrambling your brain chemistry only to leave you craving more and ever enslaved to the need for it possibly be a patch on that? The best news is that once you stop consuming synthetic substances and animal products and return to what’s real, this becomes effortless. It seems very likely that this all means that we are minimising our risk of the diseases of affluence: cancer, diabetes, and heart disease. A great side effect of this new lifestyle is our weight loss with no hunger or dieting, instead of loosing and gaining the same 10 kilos. When people tell us they can't imaging living without bacon or cheese, We think we can't imagine going back to the aches and pains that comes with the brief pleasures of the meal. That would be the case even if we missed certain foods, but the truth is that we've found a healthy way to satisfy every food craving. Eight months ago we watched a documentary on living a Whole Food Plant Based Lifestyle. (WFPBL) Our before and after photo above shows the evidence of how this lifestyle has helped us lose weight as we are both a healthy weight now and healthier as a result. We have also ditched all medications (including High Blood Pressure and Cholesterol) and minor medical issues have also disappeared. Although we didn't dive into it right away, we knew this is what we were going to aim for. Maggie was already vegetarian and Becki was her de-facto vegetarian as it was too difficult cooking two meals. Forks Over Knives was launched in 2011 as a feature documentary. Backed by scientific research, the film presents a radical but convincing case that modern diseases can be prevented, halted, and often reversed by leaving animal-based, sugars and highly refined foods off the plate … and adopting a whole-food, plant-based lifestyle instead. A whole-food, plant-based diet is centred on whole, unrefined, or minimally refined plants. It’s a diet based on fruits, vegetables, tubers, whole grains, and legumes; and it excludes all animal products, as well as highly refined foods like bleached flour, refined sugar, and unhealthy oils. Our Whole-Food, Plant-Based Diet Is Not a Diet of only vegetables though they play an important part in our new lifestyle. We love our whole grains like brown rice, millet, quinoa, freekah and buckwheat; and legumes like chickpeas, black beans, kidney beans, and lima beans. We have made many new exciting food discoveries as we have embarked on our new lifestyle. Maggie loves wandering through the Albany Farmers Market every Saturday and buying vegetables we have never tried before. We have let go of the thinking that we need to eat a certain type of green vegetable for calcium, beans for protein, nuts for fat, and so on. The most important thing in our new lifestyle is to choose the whole, plant-based food we enjoy most and try something new! Our research has proven that whole, plant-based foods contain all the essential nutrients and in proportions that are more consistent with human needs than animal-based or processed foods. There is undeniable evidence behind the benefits of whole-food, plant-based nutrition and research has proven that our bodies have the power to ward off or reverse chronic disease when nourished with whole plant foods. Natural, healthy, food is delicious and satisfying and more humane requiring fewer natural resources. We want to help more and more people eat this way so that they, too, will experience true wellness. It is not what we put into our bodies but what we put on our bodies, such as shampoos, body lotion, make up and deodorant that has an effect on our wellness. We are now using natural (vegan) products that haven't been tested on animals. Recently on our trip to Perth to attend 2 Award Ceremonies, we indicated our dietary request to be plant based. We were so happy that we weren't given just a bowl of vegies and some fruit. Our meals were beautifully presented, full of flavour and delicious. Maggie and Becki are HideAway Haven hostess and they love sharing their story with their guests. We are not pushy with our views by criticising their lifestyle choices, but impress our guests with flavourful and filling plant based meals and treating them with tasty vegan desserts and snacks. We share our research about the health benefits of Plant-Based Eating vs. Meat Eating. They’re delicious, nutritious, and easy to grow at home. What are the health benefits of eating sprouts? Sprouts are a nutritional powerhouse living super-food! When a plant germinates, its vitamin content can increase twenty-fold, making sprouts a good source of vitamins A, E, B, and C. The seeds’ proteins also change remarkably. Sprouts also tend to be very full of enzymes, which are specialised proteins that your body needs for all of its critical processes with a high protein content ranging from 20-35% protein. We are adding a nutritional punch, colour and texture to every meal with our home grown sprouts using our new Kitchen Seed Sprouter. Most of our sprouts are ready within 4-5 days and are super crunchy and fresh. I love our Albany Farmers in the Spring. So many colourful fruit and vegies for our meals. I am glad the produce knows it is Spring, because the weather certainly doesn't. The last two weeks the farmers had to sell their produce in the rain and cold. I am glad they are committed every week. I used two of my favourite Spring ingredients for our salad this week. Asparagus and Strawberries. "Spring on a Plate"
All measurements are approximate. I don't normally measure just adjust and season to taste. Prepare asparagus and roast your favourite way. I like to toss in a little oil, salt and pepper and then in the oven for 10 - 15 mins, so they are still crunchy. To assemble salad, arrange the roasted asparagus on top of English Spinach. Toss sliced strawberries evenly through the salad and top with pecans. Drizzle with the dressing when ready to serve. Enjoy and know that it is good for you as well. Spinach - excellent source of vitamin K, vitamin A (in the form of carotenoids), manganese, folate, magnesium, iron, copper, vitamin B2, vitamin B6, vitamin E, calcium, potassium and vitamin C. It is a very good source of dietary fibre, phosphorus, vitamin B1, zinc, protein and choline. Pecans - contain health benefiting nutrients, minerals, antioxidants and vitamins that are essential for wellness. The nuts are rich in monounsaturated fatty acids like oleic acid and an excellent source of phenolic antioxidants. A watercress citrus salad to help put a little sunshine in these wintry spring days we have been having. It was the last week of Navel Oranges at the markets this week, so I bought a big bag so we could have them on hand to enjoy. I love squeezing the juice into my Bircher Meusli. Since starting our plant based life-style we have become really passionate about cooking. ultra-health-foodie road. I shop at farmers markets and co-ops and Whole Foods more than I ever did before I was vegan, and I pay extra for organic. Our new lifestyle has led us to learn more about food, to the point that we are hyper-selective and sceptical about what we buy. We are having fun with our new food journey, trying things we have never tried before. We get excited by the thought of trying different recipes, food and flavors we have never tried before. We are trying new things such as Apple Pie Smoothie and Smoky Chick Pea wraps with Lemon Tahini Sauce. We are being creative and constantly improving our recipes. This recipe was delicious as the season for oranges and strawberries overlapped. Goodbye Winter and hello Spring. This salad is not only delicious but very good for you. Watercress contains vitamin A, vitamin B6, vitamin B12, iron, magnesium, calcium, phosphorus which are all required for a healthy body. Oranges are an excellent source of vitamin C. They are also a very good source of dietary fiber. In addition, oranges are a good source of B vitamins including vitamin B1, pantothenic acid and folate as well as vitamin A, calcium, copper and potassium..
Mandarin provide a boost of vitamins and minerals, yet have few calories and not even 1 gram of fat. Strawberries are not only are they juicy, summery and delicious, they're a bona fide superfood, too. Nutrient-rich and packed with antioxidants (like vitamin C), strawberries offer a wide range of health benefits, some of which may surprise you. Helps burn stored fat, boosts short term memory, low in calories – high in fibre, eases inflammation, lowers cardiovascular disease, promotes bone health, prevents oesophageal cancer, anti-aging properties, good for weight loss, promotes eye health. Think we will be eating lots of strawberries this summer. The health benefits of pistachios include a healthy heart, weight management, protection against diabetes and hypertension, and improved digestion. The vitamins, minerals, fats and protein found inpistachio are all very good for your health. We are eating a primarily plant-based diet focused around whole, fresh foods. These are the foods full of vitamins, minerals, proteins, fats and all the energy we need to live our lives. We never feel deprived – we eat what we want and that’s mostly just whole foods prepared in simple and delicious ways. We are finding the fun in healthy eating rather than experiencing the pain of poor eating. Anyone who believes eating healthy is no fun does not really understand how to eat healthy. Maggie’s choice to eat plant-based is an ethical one and Becki’s is more a health one, but we also love how a plant-based diet makes us feel. Day to day, our diet consists of vegetables, fruits, nuts and seeds, some grains like chia, oats, brown rice and quinoa and some beans and lentils. We are not on a diet and we are certainly not counting calories or worrying about our weight. Maintaining a healthy body weight is just a by-product of eating foods that are good for you. We are eating for health and happiness and real food makes us happy! This is a new lifestyle for us and we are very passionate about it. We love cooking healthy meals at home, full of every colour in the rainbow. We enjoy experimenting with recipes, new foods, herbs and flavours. We love how amazing a healthy diet can make us feel inside and out. We now have so much energy and know it’s because we are fuelling our body with healthy, whole foods! We feel very, very fortunate that we have the choice to eat the way we do with access to fresh, seasonal and local produce, farmers markets and health food stores. We have plenty of everything we need, every day. Why would we eat any other way when we have access to all this beautiful, real food?